Why is the fashion industry ignoring the petite market despite its massive size? The short answer is: it’s not, but it has a long way to go. In recent years, diversity has become much more important for brands and agencies, and petite models are slowly getting some of that attention starting with people like Chelsea Werner. Petite models have gained ground through agencies like We Speak that focus on promoting diversity. Although 15% of We Speak’s models are under 5’5’’, founder and CEO Briauna Mariah isn’t interested in labels: “It’s important for We Speak to represent models from all walks of life so we can show that beauty does not fit into a box. We Speak advocates for inclusivity and celebrates what makes us different.” In 2013, Briauna was feeling frustrated by the way she was treated as a model in NYC. “...I decided to take a step back. I wasn’t paid on time or treated the way I deserved to be treated. 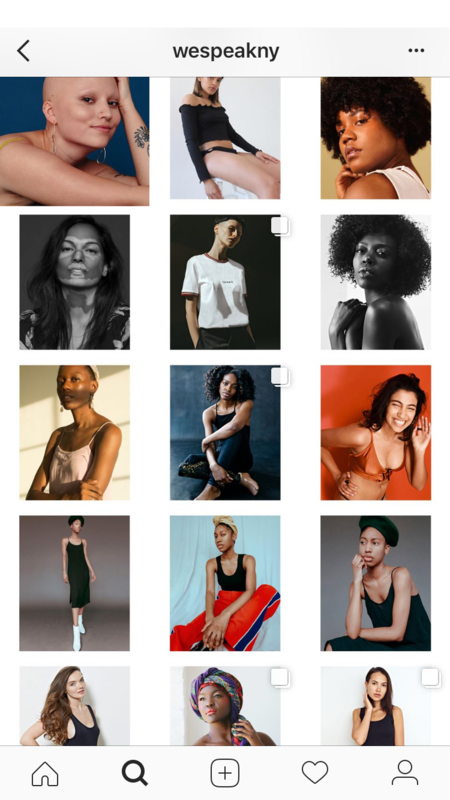 I kept seeing these recurring issues and wanted to do something about it.” The “something” turned out to be We Speak, an agency with an ambitious vision: “We won’t stop until every woman realizes she’s already beautiful.” Scrolling through We Speak’s models, both beauty and diversity are on full display. Their petite models represent different sizes, abilities and ethnicities, and each has a bio next to her portfolio with a statement about her interests: Gina Sophia is an intersectional feminist attending Sarah Lawrence for international politics and ethnic studies, Jessica Hoppe is the founder of a New York-based blog for fashion forward Latinas called Nueva Yorka, and Iris A is a “business woman of many trades, master of none” who uses a wheelchair due to Cerebral Palsy Diplegia. And although we still don’t see a ton of short women on the runway, petite models like Chelsea Werner are beginning to hold their own. In a Mic article titled “The Rise of the Very Short Model”, Rachel Lubitz writes that “over the past few months, more and more models who are Kate Moss’ height and shorter have started breaking into the industry.” Some of the major players include Amina Blue (5’1’’) who walks for Yeezy, Lily-Rose Depp (5’3’’), the new face of Chanel, and Tess Holiday (5’3’’), a model who represents plus as well as petite demographics and walked for a number of plus-sized designers including Ashley Nell Tipton. But, as Lubitz points out, just because we see more petite models included doesn’t mean petite women are being equally represented. Most of the shorter models being cast are already famous and have an extremely strong following on Instagram, so it’s not as though brands are taking a big risk to hire them. And models like Holliday, whose Instagram account @effyourbeautystandards is a tower of body positivity strength, are only being represented at plus-sized shows. Cherry-picking famous starlets and barring gorgeous full-figured women from mainstream shows doesn’t get you much credit for representation. Inclusivity for petite models is complex and difficult to achieve. Agencies like We Speak and State MGMT are working hard to tear at the prejudices that still dominate the fashion industry and our broader culture. What are your thoughts on where the industry stands today and where it’s headed? Share your thoughts in the comments below.